The Red Fox Sparrow is abundant throughout most of its range. At the southern edge of the breeding distribution in Maine, it is listed as a “special concern” species and assigned “moderate” priority in conservation efforts. Breeding populations in Nova Scotia have declined significantly in the last half century. Habitat: Wintering birds show some preference for damp habitats, frequenting thickets along forested creeks and streams. If the weather turns suddenly cold or heavy snow covers the ground, they often emerge to visit bird feeders in wooded suburbs in company with juncos, American Tree Sparrows, and White-throated Sparrows, scratching and digging into the snow until they are barely visible in their search for seeds. Fox sparrows are relatively powerful fliers, at least over short distances. The wing beats of fleeing birds are strong and fast, and the broad tail is not pumped, as in the Song Sparrows, but twitched from side to side. Migrants sing from low to medium-height perches in thickets and fairly open forest. Territorial males sing from perches near the top of tall vegetation, usually concealed within foliage and branches. Breeders also prefer damp, dense cover, including “almost impenetrable stands” of low conifers and deciduous trees and bushes in recovering burns and old fields. Behavior:Large and noisy, the Red Fox Sparrow is nevertheless a relatively shy sparrow, fleeing into dense cover, sometimes at a moderate distance, when disturbed. At the same time, this species sometimes responds with apparent curiosity to squeaking noises, mounting to the top of a brush pile or a bare twig at mid-height to investigate their source. Migrants and winter birds are most often detected aurally, by their calls or the loud rustles made by their kicking and scratching feet as they forage in the leaf litter. They are not especially social, though loose associations of half a dozen or more can be encountered during migrations. Voice: Disturbed in their thickety fastness, birds often give a square, harsh, anxious-sounding tchak, louder and lower-pitched than the tek note of a Lincoln Sparrow or junco and higher-pitched and faintly squeakier than the very similar tchuk of the Brown Thrasher. A prolonged, sweet seeb note, with slow attack and decay, is given from a perch or in flight; it is fuller, longer, and more clearly ascending than the corresponding, slightly wavering call of the White-throated Sparrow. 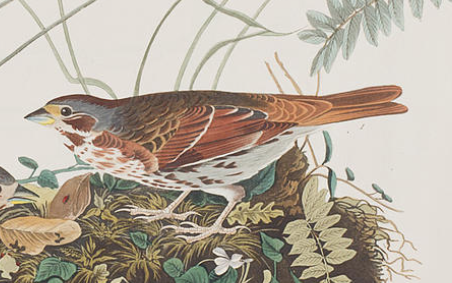 The loud, melodious song of the Red Fox Sparrow is given both in migration and on the breeding grounds; it can be heard, too, on bright, warm winter days when most other birds are silent. It typically comprises four phrases: the first is a hesitant introduction of short, usually well-separated notes; the second is a series of two or three higher-pitched whistles; the third is a parallel series of lower-pitched whistles; and the concluding phrase is a glissando cadence, sometimes terminating in a sharp tick. The “sliding” quality of the last phrase is distinctive. The entire tee-teet toota toota weewee teeup song, audible from a great distance on calm days in open woodlands, can last as long as four seconds. Both males and females are known to sing. Adult Passerella iliaca iliaca: Tail feathers cinnamon to chestnut on outer web, colder dusky brown on inner. Upper tail coverts and rump cinnamon to chestnut. Lower back gray with sparse, irregular rusty streaks; upper back and scapulars olive gray with broad rusty or chestnut streaks. Primaries dusky brown with paler brown edges, secondaries dusky brown with whitish shafts and paler rusty edges, often forming bright wing panel. Tertials dusky with broad rusty edges occupying most of outer web. Greater and median coverts rusty with dark teardrops, larger on median coverts, near tip; variable but usually narrow white tips form two jagged or dotted white wing bars. Nape gray with sparse, faint, short chestnut streaks. Under tail coverts, vent, belly, breast, and throat white. Flanks with broad, coarse chestnut streaks and hint of reddish-brown smudge towards rear. Center of upper belly and lower breast with neat dusky-reddish V-shaped spots, usually running together in center of breast to form large, irregularly shaped chestnut blotch. Throat white, often with chestnut speckling or spotting at the border with upper breast; separated from bold chestnut-speckled white jaw stripe by broad, wedge-shaped chestnut lateral throat stripe. Jaw stripe flares to reach back beneath ear coverts, creating small but conspicuous elongated white spot on side of neck. Crown gray, with variable chestnut streaking, especially laterally. Gray ear coverts with considerable chestnut spotting and streaking, divided from white jaw stripe by heavy chestnut whisker. Fainter chestnut eye line borders ear coverts above and narrowly interrupts white eye ring. Broad, clear gray supercilium paler towards bill, terminating in whitish spot above gray lore. Very long tarsus and toes pink. Thick-based, sharp-pointed bill yellow at base of upper and lower mandibles, dark gray at tip and on ridge of upper mandible; in many birds, duller in breeding season. Juvenile Passerella iliaca iliaca: “Similar to adults, but averages duller on the upperparts and has a buff wash to the underparts.” The molt from juvenile to formative plumage is only partial and occurs on the breeding grounds before autumn migration. Some birds in their first winter can be aged by the contrast between the worn primary coverts and “slightly fresher” greater coverts. Tail feathers, upper tail coverts, and rump rufous, averaging darker than in adults. Back feathers rusty brown with darker brown central streak. Primaries and secondaries rufous brown with darker brown inner web. Greater and median coverts rusty with dark brown centers, white tips inconspicuous or lacking. Under tail coverts and vent brownish white with sparse rusty spotting. Belly, flanks, and breast dull white washed buffy, with elongated triangular spots and long, coarse dark reddish streaks. Throat heavily streaked, including at center. Crown washed rusty.